Three crossover concepts showcase style studies for the 2013 Mazda CX-5. 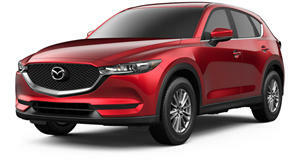 There doesn&apos;t appear to be anything particularly enticing about this trio of crossover concepts based on the 2013 CX-5. Although a first look at the diesel-powered CX-5 is an unexpected bonus. Named after actor Patrick Dempsey, who races a Mazda RX-8 in Grand-Am, the CX-5 Dempsey is powered by Mazda&apos;s new Skyactiv-D diesel engine coupled with all-wheel drive and mated to a six-speed manual transmission. Stylistically, it boasts a contrasting grey, black, and red paint scheme, 20-inch black chrome alloys and Racing Beat dual exhaust. It&apos;s also outfitted with a Specialized Bicycle S-Works Tarmac road bike and Thule Atlantis rooftop cargo box, while the interior is upholstered in black leather with contrasting red stitching. The go-anywhere themed CX-5 180 features a stylized topographical map of SoCal&apos;s snow and surf hot spots Big Bear Lake and Point Dume, and is suitably kitted out with Burton Cheetah snowboards and a Rusty surfboard. Finished in hues of Midnight, Denim, Tidal and Bay Blue with touches of Luminous Red, the custom CX-5 also gets 20-inch black chrome alloys, a Racing Beat satin chrome exhaust and a cabin decked out in Aqua and Bright White leather. Finally the CX-5 Urban boasts a Mazda Design-developed custom paint job featuring multi-dimensional shadows and various triangular shapes in different shades of Black Mica that give it a sinister, camouflaged look. Completing the stealth-like concept is a set of 22-inch Ace Alloy Scorpio matte black wheels and a Racing Beat dual exhaust.